When you receive a hand bouquet from friends or loved ones, what do you do with it when you bring it home? Do you leave it in the wrapping paper and watch it wilt all too quickly? Do you remove the flowers from the wrappers and feel that it is a pity since the packaging was rather pretty? Try to let your bouquet sit upright at all times. When a bouquet is placed lying down, the flowers are more likely to be bruised, resulting in brown wrinkles. Especially vulnerable are white and pastel coloured flowers. Remove the paper wrapper at the base of the bouquet. This bouquet has a layer of tulle which is like a skirt. So I retain the tulle, and remove the paper wrapper. If you bouquet has only the paper wrapper, you can slit it on both sides, so that the plastic wrapper inside is exposed and proceed to remove the plastic wrap. Beneath the paper wrapper lies the plastic wrap. Remove that by cutting it at the part where it is taped. Remove the water soaked cotton wool, thus exposing the stems. Cut an inch off the bunch of stems, to maximise water absorption by the flowers. Use a glass container which is heavier (than a plastic or metal container) so that the container will not topple over due to the weight of the top heavy bouquet. A tip - if you use a container that is much wider than the circumference of the bunch of stems, your bouquet will not sit properly in the container and end up tilting to one side. Choose a glass vase / bottle that the bunch of stems can fit snuggly into, approximately one-third the height of your bouquet. This will allow your bouquet to look all pretty in an upright position. Remember to change the water and cut the stems (3/4 to an inch) daily. This will help the flowers bloom better and last longer. We hope you find the simple tips here helpful and may you enjoy every single bouquet that your loved one gives to you. Flower Couture is a boutique wedding florist, customising flower arrangements for every individual customer. However, we are not purists when it comes to design. We do not mind recreating or improving upon an existing style according to our clients' preferences, using flowers available locally. Often times, our clients will email us pictures from the internet and we will recreate a similar look and style. Here are some examples of customers’ preferences which we’ve recreated. We thoroughly enjoy creating a Regal Purple Floral theme for a Malay Wedding Dais (Pelamin). Big flowers in big vases on a glamorous raised platform, what's there not to like! 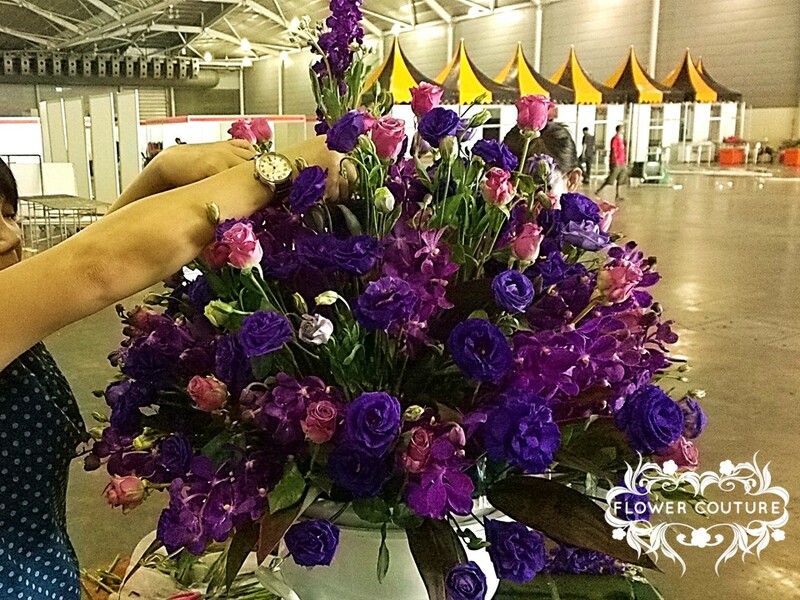 Couple of weeks ago we worked together with Eternally Yours Pte Ltd on their Malay Wedding Exhibition, arranging the flowers on site at the Singapore Expo Hall. Here are some behind-the-scenes photos of setting up the florals. You start off by filling the large vase with heaps of oasis (green floral foam) and add the leaves. Then you use the purple roses to create the general outline shape and size of the arrangement. Next you fill the space with all the other purple flowers like purple eustoma and purple orchids. Then you add the tall purple matthiola to add height to the arrangement. Lots and lots of fresh purple flowers!! If you are looking for an elegant and gorgeous Malay Wedding Dais, give us a buzz at 9857 9474. Technology has drastically changed consumer behaviour in the last five years. It is pretty cool how majority (approximately 85%) of our clients do not meet up with us (florist) face to face for discussion and confirmation of their wedding flowers. Honestly, we know that your time is precious. The less time you spend with your vendors, the more time you have for other important things in your life. Therefore we encourage our clients to use communication tools such email, phone, whatsapp and smses, to liaise with us concerning their wedding flowers. A significant segment of our clientele are also couples who are based overseas, getting married in Singapore. It is a whole lot more convenient and hassle free for them to engage our services. Without any physical meet up, we are able to deliver their desired wedding flowers on their wedding day. When discussing wedding flowers with a vendor, the key critical success factor lies in how a picture paints a thousand words. If a client is able to send us pictures of what he/she like to have, or we are able to show him/her pictures of what we can do, that pretty much concludes the discussion. Thereafter, it’s a simple matter of payment procedures and logistics. Having said all the above, there are occasions when some clients have more complex requirements or they just prefer to see us face-to-face. We are more than happy to have a chat with them over coffee (any excuse for a coffee break). You should include your name, mobile number, wedding date, time and venue (if delivery is required). As well as the floral items required, the colour theme and some of your favourite sample wedding flowers. Remember that a picture paints a thousand words, so just email or whatapps your favourite pictures to us (base on the assumption that you have done some research, surfing the net for pictures of wedding flowers you fancy). We will respond to your initial enquiry usually within 1-2 working days, either with a quotation for the items you asked about, or with some clarification questions. Thereafter we can discuss and fine tune your order via email, whatsapp or over the phone. Only in cases where the order is massive and complex will it be necessary to meet up. Once you are satisfied with the quotation, you can confirm your order (a.k.a. locking in our schedule for your wedding flowers) by making a deposit/payment via funds transfer to our bank account. Simply drop us a sms or an email when you have made the transfer and we will email you a receipt. We will touch base with you early during the week of your wedding, to run through your wedding flowers order and to firm up any logistics. We will also update you if certain flowers are not available and the alternative flowers we can use. On the eve of your wedding, around 5.30pm, you can collect your flowers or have your wedding car decorated at our Toa Payoh North workshop. For set up of wedding venues, we will begin décor set up at your wedding location 1-2 hours before your guests start to arrive. It really isn't complicated working with us. It is that simple!